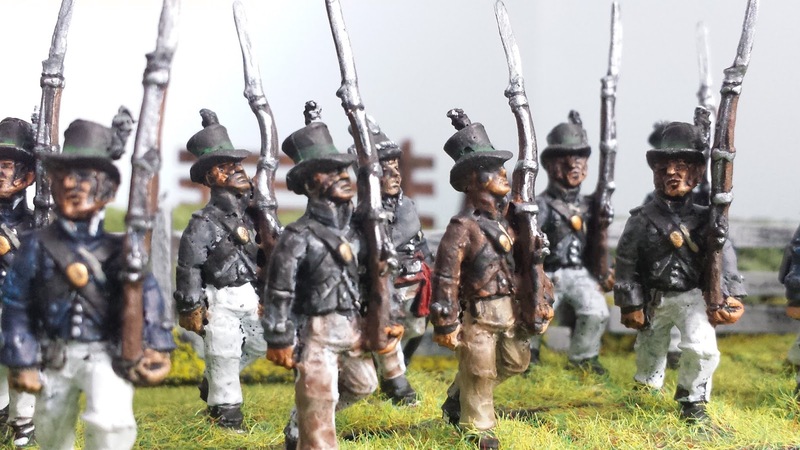 In doing my Niagara 1814 armies I have put off doing this regiment. Their reputation for cruelty and ruthlessness against the civilian population appears to be well deserved. But to complete my armies I have decided to include them. And perhaps they will play a role in a skirmish against Captain Merritt's Niagara Provincial Horse? The uniform of the Volunteers were makeshift to say the least. In 1813 they were to be issued gray jackets and United States equipment. In 1814 the were to be issued standard blue uniforms. There is also the possibility in 1813 some members wore brown jackets. A round hat (top hat) with a green ribbon round the crown and white cockade was worn. They look like a bunch of rogues! Another excellent addition to your War of 1812 collection. Nicely painted and they certainly look rough and ready. Don't see why these guys should be on the table at all. They only fielded 50 to 60 at the maximum often much less. Their uniforms should also have a prominent green band around the hat. There is a green band around the hats. Thank you for posting the link to the reenactment unit. It was one of the sources I examined before buying the figures and painting them. As to why to have them in my armies it is to complete my forces for a historical campaign. Adding all units present. I do not need a pioneer company for the Americans, but I am adding one. Same with smaller British flank companies (41st Light company at Lundy's Lane and the three Light Companies at Chippewa). As to their small numbers I plan on fighting some smaller battles with a lower ratio to scale (a company will field 24 figures etc). So better to have a full strength unit then having to buy and paint more later. Sorry if i overreacted I really love your blog and your interest in the War of 1812. Your figure painting is outstanding. Willcocks to me is the archtypical traitor and scumbag. He was an elected official of the Upper Canadian government that turned traitor mainly out of personal spite and ego. Your blog shows this quite well. The fighting value of the "volunteers" was minimal and more than cancelled out by the attrocities they committed. Using them in a game to me is the equivalent of using an SS einzatzgrupen in a WW2 game. Redblack, no offense taken. And I agree with you about the reputation of this unit and your comparison. I have been if two kinds about them. 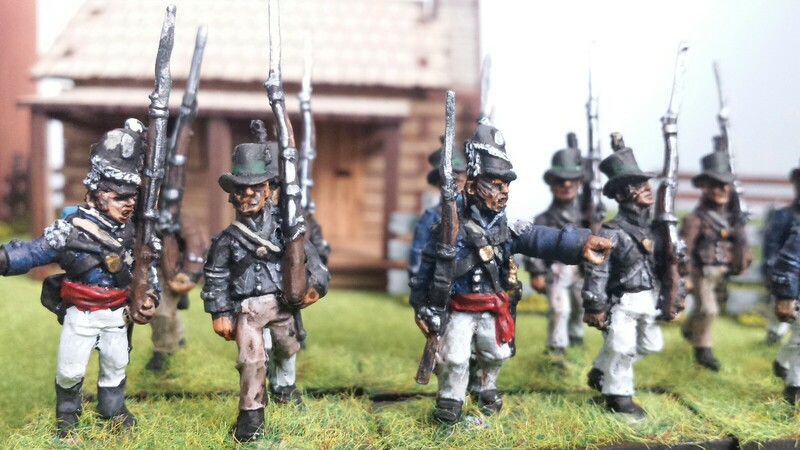 My OCD has me finishing all available regiments for this campaign no matter the size. But this units history and reputation bothered me no end. In the end I added them to my collection. And in future table top battles I hope my Canadian militia kicks their traitorous butts! As to your comparison with Arnold I think you are spot on. His burning of the town of New London Connecticut is similar in that many non military homes (who Arnold had a grudge against) were destroyed. The book, Homegrown Terror:Arnold and the burning of New London is one of the few to talk about this. Between your excellent painting and Forrest's wonderful Knuckleduster figures, this unit looks awesome!